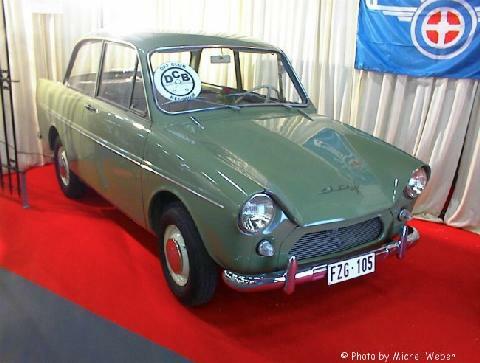 The Daf 600 was exhibited at the Dutch motor show in 1958 but newspapers and magazines had heralded its arrival for so long that the public was tremendously disappointed when confronted with a plain, ordinary, somewhat small car. The four seater had two doors and an air-cooled twin cylinder boxer engine of 590 cc that produced 22 bhp at 4,000 rpm. The car weighed 575 kg (1,265 lb) and had a top speed of under 56 mph (90 kph). That would have been that had the car not also been equipped with an unusual transmission system. There was no gearbox; the car was equipped instead with a new form of transmission called Variomatic which was a Daf invention. This powered the rear wheels by rubber drive belts which were operated by the engine vacuum. The system had the same advantages as an automatic gearbox but could drive as fast in reverse as forwards. The standard Daf 600 cost slightly less than Dfl 4,000 (about £500 at that time) which was reason enough for 3,000 people to order one then and there at the show. It was the cheapest car with an automatic transmission system for which countless inexperienced drivers had been waiting. These people had to wait a while longer though for the first cars were not delivered until 23 March 1959. Times were good for Daf and they built 20,000 cars in 1962.